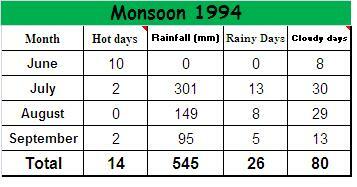 But apart from all years 1994 was an ‘exceptional’ or a very very special Monsoon season in Karachi, the wettest and the most memorable in my life. 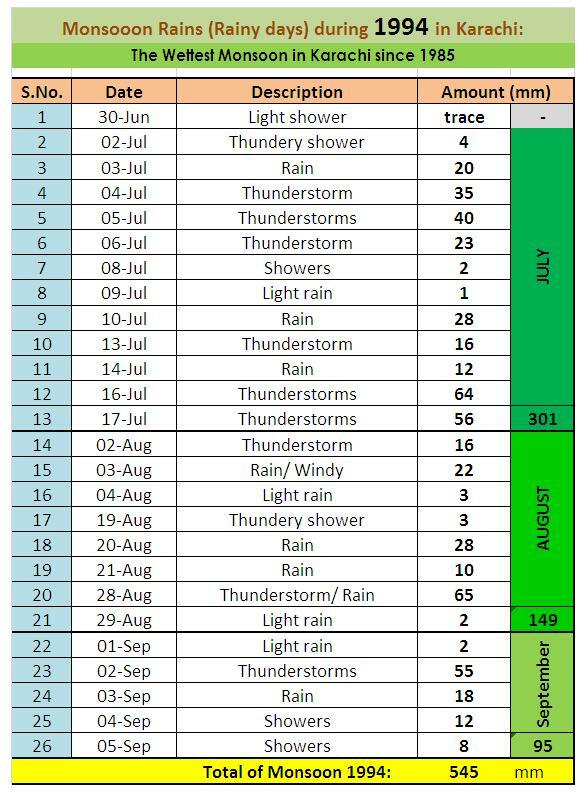 At the start of that season it was quite humid i.e in the last week of June and first shower with winds occurred on 30th June evening where first proper rain hit on 2nd July. City continued to receive good rains caused by systems mostly coming from the Bay of Bengal to Sindh till 17th July including days like July 4, 5, 10, 16 & 17 with heavy falls. After that it remained mostly cloudy with drizzle at times till July 31. Right from the start of August, rain systems again started to approach and affect Sindh that continued with breaks in the whole month of including heavy rainy days like 2, 3, 20 & 28th August and even the first week of September was very wet in Sindh including Karachi when the city received nearly 100 mm rain in 5 days of that week. During that Monsoon season ’94 Karachi and many parts of Sindh were largely affected by over 2 months of heavy rainfalls especially the power, water & sewage systems were badly hit in Karachi. ← Pakistan Weather Update & Monsoon Alert (August 20 – September 3) – Updated on August 27! In 1994 Gulti say Rains Karachi mein agaye thi warna yahan to khuda ki rahmat kabhe barasti hi nahi. Kya azaab hai is city aur province per? it has a climate like that..
KIYA TANDO JAM MAIN BARISH KA KOI CHANCE HY YA NAHI. SIR KIYA TANDO JAM MAIN BARISH KA KOI CHANCE HY YA NAHI.